Whoever said travel while they’re young must have had (a) first class tickets, (b) a direct flight, and (c) a very patient husband. I had none of the above. Not exactly at least. The first time I traveled with Reu, he was three months old and my sister was with us for the departing flight and connection. Brave soul. Having her there made a huge difference for emotional support. She was also a human shield from other passengers (cue uncomfortably close sneeze), and having two extra arms to carry stuff was huge (although if you’re traveling solo, don’t underestimate the kindness of strangers). I used to travel with a carry on, now there are a few more things involved. Here’s a photo of my sister with all the things at baggage claim. Clockwise from center: Car seat, my sister, her backpack, her carry on, stroller, baby Reu, large suitcase, not pictured: Reu’s diaper bag aka my carry on, and me. I’ve traveled solo with my baby on a few flights since then, with my parents and Reu on a couple of flights, and with my patient husband on a few more. Reu just turned eight months old and he’s been on 10 flights. Yes, we travel a lot. 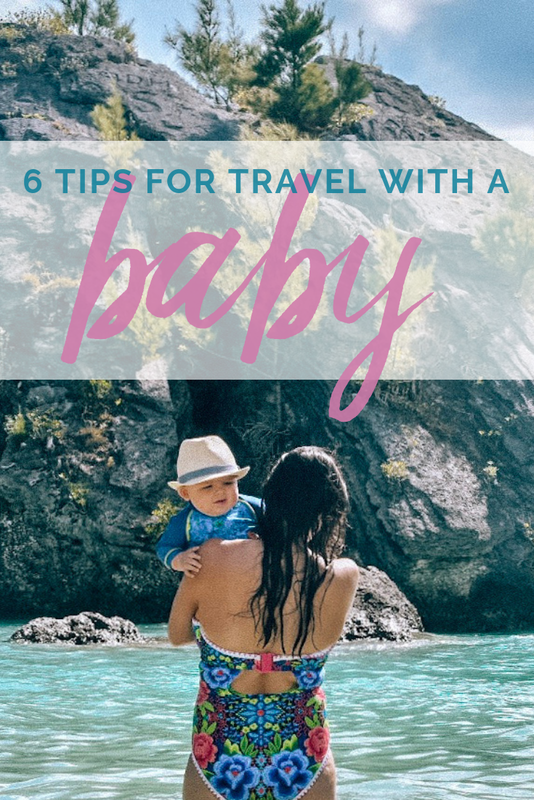 Below, I’ve compiled some tips for travel with a baby, whether traveling with family or solo, and travel essentials for baby. You’ll also want to read my guide for how to travel solo with an infant. Easier said than done, take it from me. From Central Oregon, in order to make this possible, we drove to Portland and managed to find one stop flights to upstate New York. Fewer flights mean fewer take-offs and landings, which are the hardest part for babies (and their parents). If you’ve ever felt pressure in your ears or head while flying, imagine that feeling amplified - that’s what some babies go through while flying. A well-known tip to ease pain during take-off and landing is to feed your baby, whether that means breastfeeding, bottle-feeding, or sippy cup sipping, the sucking motion tends to help relieve pressure. If you can help it, don’t fly during flu season. If you must, get a flu shot. No matter what time of year you fly, be prepared to wipe down just about everything - seats, tray tables, windows, arm rests, the passengers on either side of you, I could go on. If you’re breast feeding, allow your baby to sneeze and snot on you, it may sound strange, but that baby breath will help you produce exactly what your baby needs to fight off an oncoming cold. Be aware that travel can sometimes change your baby’s patterns. Build in a little extra time between connections so you’re able to care for your baby and get a break from being on the plane. When mine was three months old, he ate incessantly on the flights, probably out of nervousness. Around seven months, despite always changing him before the flight, he needed multiple changes during the flight. Yes, those tiny airplane bathrooms have a fold down changing table that you probably never noticed until now. Traveling with a baby isn’t easy but it can be well worth the effort. By now you’re probably hungry and out of time Tom grab a snack to eat with that free hand, so I recommend stuffing snacks for you in your baby’s diaper bag (aka your carry on). I’m all for traveling to visit family (two of our trips were to visit our family in St. Louis and New York), but when your destination is somewhere tropical, or if you’re going on vacation in general, I swear it’s easier. So plan a trip to a destination that excites you. No matter how far flung, make your destination feel like home. Whether that means traveling with a Dock-a-Tot, a familiar place for baby to play and sleep or knowing where to find or rent baby-friendly amenities, you’ll want your baby to be comfortable. We did all of the above in Bermuda and it made Reu feel comfortable from the moment we arrived. Just look at this happy baby! We love the Dock-a-Tot for its portability and flexibility. It fits inside our suitcase and provides a familiar place for Reuben to sit and nap, whether at night in our room, or during the day at the beach. Look into renting baby equipment or ensure your hotel/resort offers baby-friendly amenities. You’ll be glad you did. Little Longtails is a kid concierge service that not only provides baby-friendly rentals, but also kid-friendly itineraries to explore the island of Bermuda. Do a little digging to see if your destination offers something like this - it was a lifesaver. We rented a box of toys and books for ages 0-12 months, beach toys, a beach tent, a high chair, and a bathtub insert. Best of all, Linda the owner, dropped everything off on our first morning of our stay and picked it up the day we were leaving. It couldn’t have been easier to keep Reuben entertained. Have you traveled with your baby? I’d love to hear any additional tips you have for travel with a baby. Comment below.